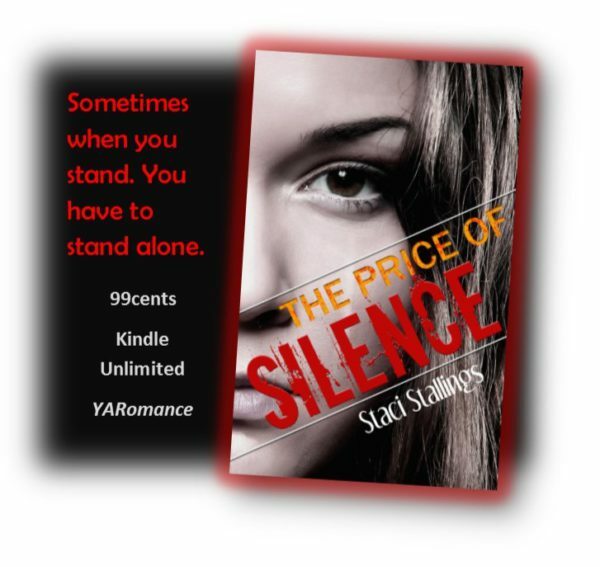 “The Price of Silence” was the third novel I wrote, and with this one, I struck out in the direction of YA, or young adult, though I didn’t know what that was at the time. Still trying to marry my love of romance with how to write inspirational and not become completely unmarketable, this is another of my least overtly Christian books. The story idea was born out of several incidents in my teaching career. The first one happened while I was student teaching in the early 90’s. This was 9 years before Columbine would make headlines around the world. It was during a time when school shootings were unheard of, but guns in schools were just becoming a real issue. At the time I was a student teacher in the business department of a large high school. During class, one of the student teachers in another business class had a student come up looking very shaken. The student asked to go to the principal’s office and permission was granted by the student teacher. Shortly the principal and vice principal showed up at the door and with no warning marched in, took hold of a student and his backpack and marched him back out. Come to find out, the student, who was in love with the girl who had gone to the principal, had shown her boyfriend the gun and she happened to see it. That one felt really close as I was literally one door down. However, I think I and a couple other student teachers even knew about it as it was kept under the radar almost completely. Had I been subbing in the journalism class that day, I would have literally been feet from where the student walked in and started shooting. The fact that I always stood outside the door during class changes would have put me right there. Yes, I’ve thought about that many times. Three years later, I had just turned in what would be my resignation come the end of the school year for my permanent teaching position. I was pregnant with our first child and finishing up teaching. I had a typing class, which then crossed the parking lot to go to math. In the math class a student saw another student with a gun. That year we had had a lot of “gang-related” incidents at the school, owing to one student who had moved in. Because we were a private school, many times we would get kids that had been removed from public school because of discipline issues. He was one of them. Only in the eighth grade, this kid had trouble written all over him. Come to find out, he had goaded one of the girls into bringing a gun as kind of an initiation. They had the gun in my class, but did not take it out until math. The student who reported seeing the gun would later leave the school for her own safety, and the following year after leaving the school himself, that student would be arrested for killing a girl and leaving her body on the railroad tracks. So “The Price of Silence” for me was something of a clarion call to teachers and parents that bad things happen in our schools, and often because students don’t have a solid support system, they are left to try to navigate and deal with situations far above what they should be dealing with. The title for this one was the third try as the book went through multiple revisions. The first title “Gang-Related” was on the book when I printed off a copy and gave it to my mom. She said, “We are going on vacation, so I won’t be able to read anything until we get back.” I told her that was fine. Three days later she called me. “I hope you know I’m not packed and we leave tomorrow.” I couldn’t imagine how that was my fault until she continued, “I thought, ‘I’ll just read a little bit….’” Ha. Ha. Famous last words with one of my books! The second title which was probably a bit melodramatic but also rather fitting for what Robyn goes through in the book was “A Slow Dance Through Hell.” Alas, that one didn’t stick. And so my third novel became “The Price of Silence.” I still pray it will open some eyes and minds so that we can work together to secure not just our children’s futures but their presents as well. The topic has only grown more important over the years, and it’s one I think we should all be aware of and prepared to deal with–especially if we have kids or grandkids that we love! Wow! I work in a high school and your experiences are downright unsettling. They definitely unsettled me! Thanks for stopping by! Things we read in the newspaper….really DO happen..from your experience! Frightening! And believe me, I thought they only happened to “other people.” Clearly, not so much! Thanks for stopping by! Schools can be dangerous places these days. Unfortunately. The thing we have to remember is that these kids are PEOPLE with real emotions and issues. It’s tough, but helping them with the other things is as important as the subjects taught. I understand what you’re saying. The last three years I worked in a middle school and I saw so many sad, lonely, and troubled kids. My goal through the years were to be a light for them. I’m not sure if I was that, but daily I prayed to be someone students could talk to. Next year I may be going up to the high school so I’m sure I’ll see more. These kids need Christ in their lives sooooo much. So many just want to be loved and accepted. I hear you there! They need Christ in a major way. Taking God out of schools has not done us any favors… these kids are the products of the first generation when He was taken out. I’m afraid we are now reaping what we’ve sown. This book is a game changer and should be in high school libraries. If more people understood how insidious this stuff can happen, I do believe it would be a game-changer. Thanks for saying so! Thanks for sharing your experience and inspiration for the book. I come from a family of teachers and have many friends who feel honored to be educators. Who would think wanting to educate the next generation of thinkers would be so dangerous? So true. My sister is in an elementary now, and even that young, they are having issues with kids who simply have no empathy for anyone. God bless and help our teachers! Oh my goodness, that’s so scary!! God’s hand was definitely on you Staci in your time of teaching at that school. That’s why we’ve always tried to be a support system for our kids when they were in school, because they have so much more to deal with than us adults (school, peer pressure, being bullied, poor home life, etc) and put hormones on top of that…whew! It can be quite an explosive mix. I’m glad that one boy had the courage to speak up, it could have been much worse! I think we need more of that. I think too often kids are afraid to get beat up or whatnot for being a snitch if they are found out or maybe they think someone won’t believe them. I think reaching out as adults will help those kind of kids to know someone is on their side no matter what. Having that support system is so important in that stage in their lives and can really make a difference! Thus the title of this book “The Price of Silence.” We don’t realize it, but we are all paying the “price” for the silence our kids are forced to bear when teachers and parents don’t listen and step up to help and be that support system. This is critical.